GSM2-2016, UPSC asked about Coelho case (2007) with respect to Hardik Patel / Jat / Maratha agitation for reservation. Hence we’ve to prepare such SC judgements in news. This time- on national anthem 1) Bijoe Emmanuel 2) Shayam Narayan Chouksey. 52 seconds: full version of the Anthem (five stanzas). 20 seconds: Short version of the Anthem with only first and last stanzas. When receiving foreign dignitaries in India– their national anthem played first, then Indian national anthem played. Jana Gana Mana first sung in INC’s Calcutta session (27 Dec). critiques allege the words “Bharat Bhagya vidhata” and “Adhinayaka” mark the coronation of King George V.
1950 Constitutional assembly adopted the Hindi version of Jana Gana Mana as “National Anthem” (24 Jan). 1962 Practice to play National Anthem in cinema halls at the end of the movie, to instill patriotism in the height of India-China war. 1971 Prevention of insult to national honor act. It prohibits desecration of country’s national symbols, including the Flag, Constitution, map and Anthem, with jailtime upto 1 year. 1986 Bijoe Emmanuel case: Remaining silent during anthem is also permitted under “Freedom of conscience”. 2002 Flag Code of India to regulate the size, display and decorum of hoisting national flag in public. 2003 This practice of cinema-anthem faded eventually. 2016 Shyam Narayan Chouksey case: SC orders playing of national anthem before start of the movie in cinema halls. Jehovah’s Witness is a sect whose belief are distinct from mainstream Christianity. They believe saluting a flag or singing an anthem, ascribes salvation not to God but to State / its leaders. Hence flag salute and anthem singing forbidden in their sect- be it Indian, American or British. In Kerala, three students from this sect, were suspended for refusing to sing the national anthem. Supreme court overturned the suspension because right to freedom of speech and expression included the right to remain silent [Articles 19(1)(a)] and Freedom of Conscience [Article 25]. In a public function, the then minister Shashi Tharoor asked audient to put right hand on left side of chest during the anthem. (because Americans do like that during their anthem). Shashi Tharoor was booked under “Prevention of Insult to National Honour Act, 1977” for desecrating and interrupting the national anthem. 2013: court discharged him saying he did not ‘desecrate’ the anthem nor he forbid anyone from singing it. Indian Fundamental rights are borrowed from USA Constitution. 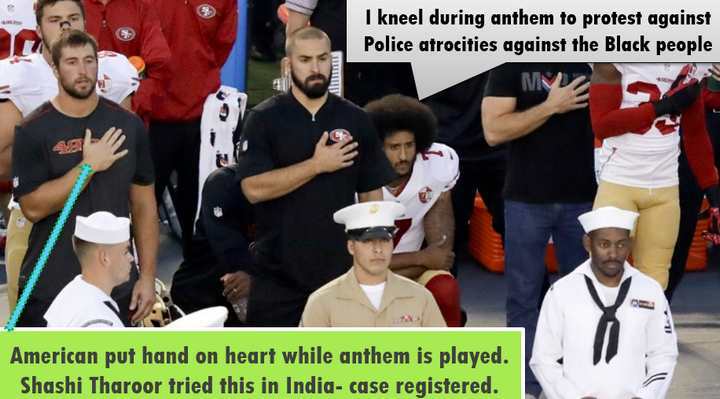 2016: NFL player Colin Kaepernick did not stand up, but knelt during USA anthem to protest against the police atrocities on the black people. President Obama defended Colin’s action saying it was his Constitutional right to raise legitimate issues. Earlier US Supreme court declared even flag burning to be part of the constitutionally protected free speech. Shyam Chouksey had gone to watch Kabhi Khushi Kabhi Gham(K3G) but dejected to see audience did not stand up during a scene in the movie where SRK sings national anthem. He approached Madhya Pradesh HC. The then justice Dipak Misra order film to delete the national anthem scene. But SC overturned HC order. Years later, same Justice Dipak Misra elevated to Supreme Court. Same petitioner Shayam Choksey again files PIL (under Art.32) to frame guidelines on the playing of the National Anthem. Resulting into this order to play anthem before movie. Compulsory for cinema owner to play anthem before movie. Goes against the spirit of Supreme court’s Bijoe judgment (1986). (Counter of counter view): here the anthem played *BEFORE* the movie starts. So no disruption. compulsory for audience to stand. SC did not prescribe who’re exempted? Non-citizen, pregnant women, PH, elderly etc. Patriotic “vigilantes” may hackle people for not standing up. Many people who stand up may well be scoundrels and devoid of any sentiment of patriotism. Because “patriotism is the last refuge of a scoundrel”- Samuel Johnson. Cinema hall’s entry and exit doors be closed while playing the National Anthem What if fire breaks out? SC itself ordered in Uphaar tragedy that cinema doors should never be closed. cinema screen must show national flag image when National Anthem is being played. specification not given- whether static image or animated clip of flag? What if there is text/advertisement/ website watermark below the flag wallpaper? Full version of anthem must be played (52 seconds) Even Home ministry guidelines allow for shorter version of anthems (20 seconds) in numerous occasions. No person can have commercial benefit for singing anthem Bollywood / local singer can’t get royalty for singing anthem? Is it not violating prohibition against forced labour (under Article 23)? No film, drama or show can have the National Anthem as part of the show. What If script of the movie demands a scene where anthem is to be played to dramatize the scene? e.g. Sunny Deol beating Pak. Terrorist to pulp or Ek-din-ka-CM Anil Kapoor teaching lesson to a corrupt politician? Such restriction is not provided under Prevention of Insults to National Honour Act, 1971. Cinematograph Act, 1952 or Central Board for Film Certification (Censor board). National anthem or its part can’t be printed on any object. Good step. In past, foreign companies have denigrated images of Gandhi and Indian flag by printing them on footwear. This is meant to instill patriotism. The author of national anthem Rabindranath Tagore himself was highly critical of nationalism especially in its overt forms. “I would prefer humanism over patriotism”, said Tagore. Fundamental duty of every citizen to respect flag and anthem. There are so many fundamental duties, will they give directions to enforce them? How about anthem before IPL matches and TV-serials? Precious time of court is being used in such peripheral matters such as cinema halls and Sardara-ji jokes. While the “intent” of the court may be good, but the method is not good. During the “Chaumasa” period, Jains undergo fasting (“Santhara”) to attend penance. They’re glorified, honored and lauded by the community and showered with gifts. If person dies, procession (“Shobha Yatra”) organized in grand fashion. 13 years Jain girl dies after 68 days fast In Hyderabad- 2016, Oct.
Police arrests parents on NGO complaint of child abuse and negligence. Should minor children be allowed to undergo “Santhara”? Yes. Fundamental right to religious freedom is guaranteed by constitution. But here, girl’s right to life is violated, by the negligence of her parents and encouragement by the religious leaders. Fundamental right to religion- is subject to public health and morality. This girl attended school for 41 out of 68 days of her fasting. She died not during the fasting but 24 hrs after completion of fasting (“Paarnaa”). Minor children can’t focus on studies with such long fasting. This girl was allowed to drink water only once in the evening. “Santhara” is meant for cleansing of body and mind. Similar traditions exist in Hinduism (Upwas in Shravan / Navratri) and Islam (Ramzan) as well. This type of long fast is usually meant for elderly people who want renunciation / death (“Sallekhana / Samathi Maran”) because they’ve lived their life and body is no longer functioning or suffering from incurable disease. But, now “Santhara” fasting has become a competition among some parents. Even political leaders attend and cherish it to gain political mileage. Assam Education dept. has discontinued the weekly Friday holiday in Government run Madrassas. They’ve to follow the work-week like any ordinary school. On Friday, they’ll get 1 hr break to offer Jumma-Namaz, then have to resume work / teaching. Headmaster will be suspended if he doesn’t enforce this rule. Q. should government-funded madrassa be given Friday holiday? Anti: Friday holiday not required. Sunday: official weekly government holiday in India, US, Europe. So, There cannot be two holidays a week. Madrassa students receive less education per week than ordinary schools. Madrassa teachers getting same salary for doing less weekly work than ordinary government School teachers. Communally divisive agenda will hurt the secular fabric of India. There is no law, circulate or GR that recognizes Friday as government holiday in India. “Saffronization” of education must be stopped. This is an example of “intolerance” against minorities by Assam’s BJP government. But, Government funded institutes have to abide by government rules. Besides, the Muslim employees, students given break-time to offer namaz in 1-1.5 hrs, then they can resume work / studies. Visit Mrunal.org/polity for more study material on Indian polity and governance for UPSC prelims and Mains General Studies Paper-2. This is much better than videos. Thank you sir. Sir, weekly ek article daal do! Thanks a lot Sir. Your articles are unmatched. What is meant by GR mentioned in the question related to holiday in madrassa’s ? Mrunal, now SC has admitted that there is no concept of National Song. All that is mentioned in the Constitution is National Anthem and National Flag.